True story here. A few years ago, I sat with the Sales VP of a major corporation I worked for. We were good friends and decided to meet over lunch. I was relocating. He was recruiting me to become part of the new regional team. “I appreciate your offer,” I responded. “But working for Company X morally, ethically and spiritually compromises me.” He leaned back in his chair, looked me in the eyes, and sighed. He had absolutely no response to my statement. What percentage of your workforce holds that same perspective, but unstated? The pace and cadence of digitally-connected organizations challenges the concept of ethical corporate culture. How large are the gaps between employee handbook content, corporate mission and vision statements? How consistently and successfully are these ideas embraced, enacted and reinforced in the workplace, each day? Can abstract values reinforce a digitally-underpinned, ethical corporate culture? The concept of the values-based organizational culture originates from Edgar Schein, Emeritus Professor at MIT Sloan School of Management. His seminal work, Organizational Culture and Leadership (originally published in the 1980’s) defines three distinct levels of organizational culture. (Yes, I’ve read the book). Cultural artifacts are observable elements such as dress code and office lingo. Then, espoused values define the organization’s value system, including behavioral rules and how employees represent the corporate behavioral norm to each other and to outsiders. Finally, shared assumptions include deeply embedded behaviors which may not be documented, but certainly are inferred. Shared assumptions anticipate how employees react to situations. However, the dynamics of the digital workplace offer a fresh set of value challenges. First, the post-industrial concept of remaining an employee “for life” is no longer the workplace norm. Many employees have expiration dates contingent on career strategy, performance or organizational shortcomings, or merger and acquisition. Then, leadership may be hired to flip the organization rather lead it into perpetuity. Also, a growing segment of the workforce are migratory and transient: gig-employees or remote digital workers. As a result, creating and transferring a value continuum across the corporation is easier said than done. 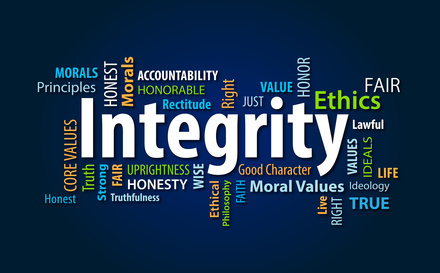 Ultimately, the survival of ethical corporate culture relies on employee integrity. The challenge becomes how quantify the abstract, qualitative notion of ethical corporate culture. Levels of employee engagement, external factors impacting security, and often departmentally-specific churn, exert selective pressure on the viability and evolution of ethical corporate culture. Perhaps the best compass ensuring continued cultural quality becomes hiring for integrity. Integrity should, by its nature, defy shape-shifting trends and fads. The 2015 Deloitte report on building world-class ethics and compliance programs targets a positive culture of integrity as the program’s ground zero. Integrity is defined as being honest, having strong moral principles, being whole and undivided. 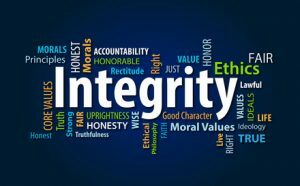 Integrity differs from loyalty in that loyal individuals pledge support or allegiance, regardless of being motivated by strong moral principles. Within an ethical corporate ecosystem, the goal becomes attaining high levels of agreement based on shared assumptions (remember those?) about what is positively valued by an organization. In addition, shared agreement is reached about what is negative and devalued. In addition, these shared assumptions infer an equally high level of intensity, passion and engagement around showcasing those agreed-upon values. Will rules-based compliance programs guarantee values-based employee and leadership integrity? However, digital transformation of the workplace brings with it new selective pressures for survival of the fittest corporate culture. Enter federally-mandated safety, security and regulatory requirements. As a result, organizations become busy with their tangible artifacts: various compliance To-Do lists. Consequently, corporate values and ethics become synonymous with assessing, measuring and auditing compliance to rules and regulations. Furthermore, preserving organizational “culture” dissolves into producing audited, assessed, measured and analyzed compliance reports. After all, these quantifiable, documented results demonstrate to stakeholders, stockholders and regulators that an organization, and its employees, follow stated rules. However, this trajectory evolves human resource professionals into compliance police. What is lost in translation is their potential role in co-creating human capital strategy leveraging an ethical corporate culture. At best, ethical human capital hiring strategy leverages critical thinking skills and workplace responsibility. Perhaps a better strategy for curating ethical corporate culture leverages a human capital strategy emphasizing employee ownership of and responsibility to commitments and agreements. When this model is adopted, the target is hiring for critical thinking skills as well as functional skill sets. These core skills include the ability not only to discern right from wrong, but also involve providing cultural avenues to take action. After all, creating an enduring, ethical corporate culture curates a set of commonly espoused, shared positive values and behavioral norms. These norms and values enhance employees’ own value sets. Otherwise, employees become disenchanted, unproductive and unengaged because they lose belief in organizational ethics. When that happens, you potentially create a sandbox for moral, ethical and possibly even spiritual compromise. This blog post originally appeared on the TalentCulture blog under the title: “Can Ethical Corporate Culture and Compliance co-exist in Today’s Digital Workplace?” It is reproduced on this blog with our mutual permission. Babette Ten Haken is a corporate catalyst and innovative speaker. She serves organizations as a strategist, coach and storyteller. Babette’s One Millimeter Mindset™ Workshops and Speaking programs leverage collaboration to catalyze professional innovation, workforce engagement and customer success for customer retention. Babette’s playbook of business-engineering team collaboration hacks, Do YOU Mean Business? is available on Amazon.